Histological techniques 3. Embedding. Resin. Atlas of plant and animal histology. Very thin sections, less than 100 nanometers, are needed if we want to study the ultrastructure of cells at transmission electron microscopy. These sections, known as ultrathin sections, can be obtained from very hard material using ultramicrotomes, special microtomes designed for obtaining very thin sections. Samples can be hardened by fast and deep freezing or, more frequently, by embedding the sample in resins. Epoxy resins are the most common embedding medium for electron microscopy studies. Liquid resin is infiltrated in the samples and is later polymerized without affecting (much) the ultrastructure of cells. 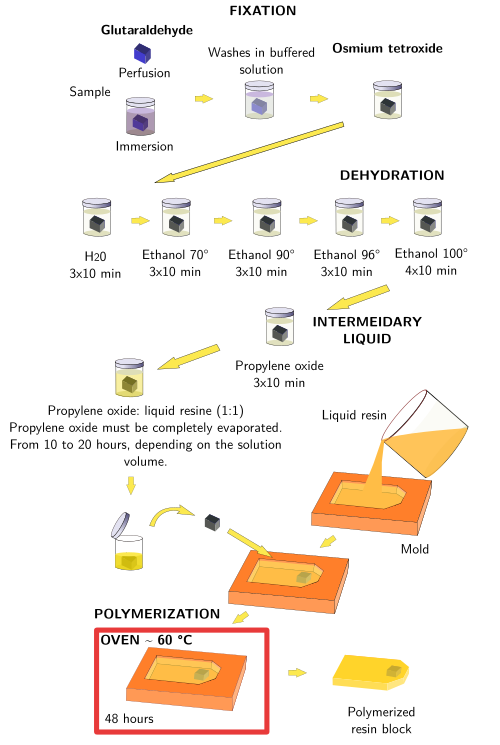 The standard procedure embedding with for epoxy type resins is similar to that described for paraffin embedding, but with some modifications. The protocol starts with fixation of samples by immersion or perfusion, and follows with dehydration, intermediary liquid, infiltration with liquid resin and resin polymerization to get it solid. Some resins are partially miscible with water, like the acrylic LR white, and a total dehydration of the sample is not necessary, nor an intermediary liquid. Polymerization of epoxy resins proceeds usually at 60 ºC, while some media like methacrylate needs ultraviolet radiation at low temperature, which is good for histochemistry. a) Fixative solutions contain glutaraldehyde, and there is a postfixation step with osmium tetroxide. It is a twofold fixation, with glutaraldehyde preserving the cellular ultrastructure and osmium tetroxide retaining the lipids in the cell membranes, that otherwise would be extracted during later dehydration, lipid solvent, and polymerization steps. b) Samples intended for resin embedding are much smaller than those for paraffin embedding. They are usually a few millimeters thick, because we are not interested in the general organization of tissues but in the ultrastructural features of small regions or even of a particular cell type. If we want to study different regions of the same organ, it is recommended to obtain small pieces of each region we are interested in, and embed them in different resin blocks. c) Most resins for embedding are not hydrophilic. So, the water must be removed from the sample and be exchanged with an organic solvent, the intermediary liquid. The samples are dehydrated in ascending ethanol grades. Acetone can also be used. Propylene oxide are the common intermediary liquid between the absolute ethanol, or acetone, and the resin. d) Hardening of resin is not by cooling, but by polymerization, usually done at 60 °C. e) Several molecules can be added to the embedding medium, the resin, to modify the polymerization speed and hardness of the final resin block. They are known as accelerators and hardeners, respectively. Epoxy-type resins provide a homogeneous polymerization and it is easy to get regular ultrathin sections. On the other hands, obtaining good polymerization and proper sections is a bit more difficult. General protocol for embedding in epoxy-type resins of fixed samples. Time in each liquid may be changed according to the sample type and size.